Kia has comprehensively upgraded of its popular cee’d, a core model in the company’s continuing success in Europe. It now delivers a more dynamic performance and offers greater quality and a more appealing design. The interior and exterior styling of the current cee’d has evolved into a more exciting new look, with a wider range of engines and transmissions. The improvements include Kia’s all-new three-cylinder 1.0-litre T-GDI engine, as well as a range of new safety, comfort and convenience upgrades. The changes apply to every model in the cee’d range, incorporating the five-door cee’d hatchback, Sportswagon (sports estate ) and three-door pro_cee’d. Kia tells us that the upgraded model will come with a new ‘GT Line’ specification, offering buyers the sporty looks and dynamics of the GT models as well as the versatility of the conventional cee’d model family. The GT Line specification is available in Ireland on two of the three cee’d body types, namely the five door cee’d and three-door pro_cee’d. The upgraded cee’d gets a series of visual modifications to modernize the car’s appearance. At the front, the cee’d retains Kia’s hallmark ‘tiger-nose’ grille, sleek wraparound headlamps and integrated fog lamps. Changes to the ‘face’ of the cee’d include a more angular and wider bumper, with chrome trim around the fog lamps, and a new oval-shaped grille mesh echoing many of the shapes and design forms on the front of the car. A similar change has been made to the rear of the cee’d, with reshaped bumpers and sporty-looking reflectors adding greater volume and strength to the car’s appearance. LED rear lamps complete the back end, adding a higher level of refinement and functionality. New 16- and 17-inch alloy wheel designs have been added across the range. The cabin in the Kia cee’d retains its quality and has received a range of minor styling upgrades to build on interior design. The basic form of the cabin remains unchanged, but a number of subtle enhancements bring a more modern look and feel to the interior. At the press conference, Kia spoke about the diesel variants, the upgraded interior of the cee’d offers improved noise, vibration and harshness characteristics. Additional sound-absorbing materials have been adopted to cut engine vibrations intruding on the cabin. All diesel engines have also been fitted with sound-absorbing material to the engine block, oil pan and diesel particulate filter. The upgraded cee’d offers a wider choice of powertrains than before, with all engines now compliant with the Euro 6 emissions standard. This includes from the launch of the 2016 cee’d, Kia is introducing its all-new 1.0-litre ‘T-GDI’ (turbo petrol direct injection ) engine. Kia says that this new downsized, three-cylinder power unit has been engineered to improve fuel consumption and emissions, while offering strong, willing performance and immediate responses to driver input. This is the first of Kia’s upcoming range of downsized engines to make its debut in Europe. Here in Ireland Kia are offering the higher powered 1.0-litre T-GDI produces 120 ps and the same 172 Nm torque. The maximum engine torque is available from 1,500 to 4,000 rpm, making it an incredibly flexible engine under all driving conditions. Pending homologation later this year, both 100 ps and 120 ps are expected to deliver the lowest CO2 emissions of any petrol-engined cee’d to date. The diesel cee’d continues to be the most popular choice for Irish buyers, and the 1.6-litre CRDi diesel engine has also been upgraded for its application in the new model. A new high-pressure injection system and continuously-controlled variable oil pump reduce friction losses in the engine, with the lower powered 110 ps version available across both the standard cee’d and new GT Line range. CO2 emissions fall to 102 g/km, or just 94 g/km when fitted with Kia ISG (Idle Stop/Go ). Available with both the enhanced cee’d range and the new GT Line variant, the higher powered 1.6 CRDi engine now produces 136 ps (up from 128 ps ), and 285 Nm torque (improved from 265 Nm ). With the small increase in performance, the engine’s full torque is now available from just 1,500 (down from 1,900, when equipped with a manual transmission ), resulting in more effortless acceleration under all conditions. The upgraded cee’d features a second new technology debut for Kia, with the arrival of the brand’s all-new seven-speed double-clutch transmission (DCT ), available exclusively on models equipped with the higher powered 136 ps 1.6-litre CRDi diesel engine. 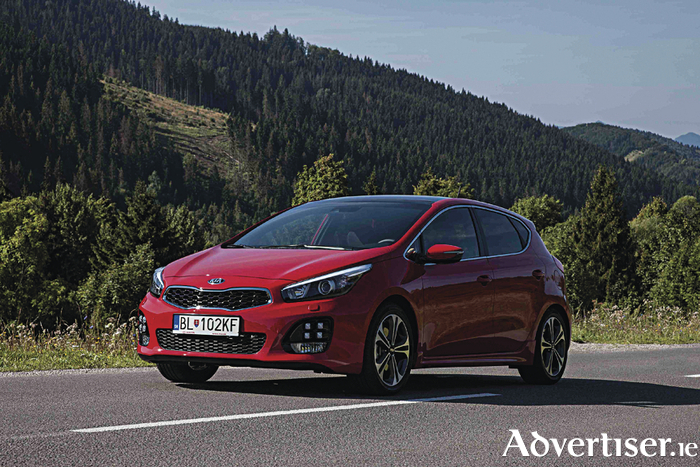 Kia’s new DCT is capable of handling the higher torque outputs of the modified engine fitted to the upgraded cee’d, with a higher capacity than the six-speed torque-converter automatic transmission it replaces. Like the new 1.0-litre T-GDI power unit, Kia’s new DCT has been engineered with low fuel consumption and a sporty driving feel when in manual mode, and with comfort and smoothness when left in automatic mode. The new DCT brings considerable tax savings to Irish drivers with road tax down from €390 to €200 .The retail price of the car is also down €500 from it’s 6 speed successor . Engineers have made a number of modifications to the suspension and chassis of the upgraded cee’d in order to improve ride comfort and handling, endowing the car with more dynamic performance. The NVH characteristics of the suspension in the upgraded cee’d have also been improved slightly, with the adoption of a hollow stabiliser bar, replacing the previous solid stabiliser, to reduce road noise. “Competing in the highly competitive C segment cee’d is an extremely important part of our product mix ,second only to our best-selling Sportage model, James Brooks, Managing Director of Kia Motors Ireland, commented to the Advertiser.